Arcanum’s Dane Craport (67) wraps up Bradford runner Hunter Gheen early in the first half of Friday night’s game at Bradford. The Trojans won the game 48-7. Arcanum’s Devin Keckler (11) gets around the end on a 31-yard touchdown run in the first quarter Friday night at Bradford. The Trojans won the game 48-7. Arcanum’s Devin Keckler (11) intercepts a Taven Leach pass and returns it for a touchdown in the first quarter Friday night at Bradford. The Trojans won the game 48-7. Arcanum’s Devin Keckler (11) gets pulled down from behind by Bradford’s Dylan Mitchell (65) late in the first half of Friday night’s game at Bradford. The Trojans won the game 48-7. Arcanum’s Devin Keckler (11) turns after catching a pass at the 2-yard line and scoots into the end zone for a touchdown Friday night at Bradford. The Trojans won the game 48-7. 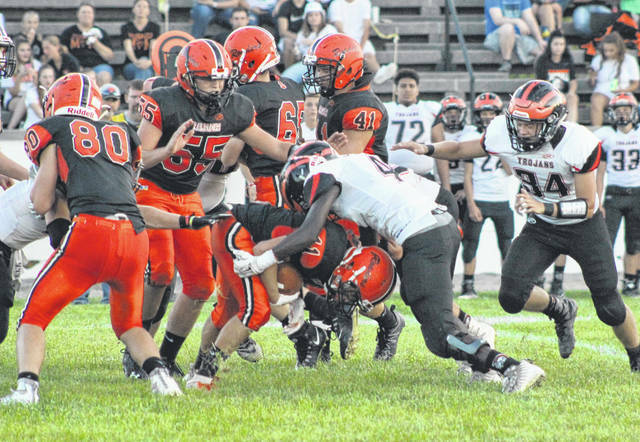 Arcanum’s Isaiah Hootman (4) tackles Bradford runner Gaven Trevino (11) in the first half of Friday night’s game. The Trojans defeated the Railroaders 48-7. Bradford’s Larkin Painter (80) is about to get tackled from behind by Arcanum’s Cory Ross (2) after catching a pass over the middle from Taven Leach on Friday night at Bradford. The Trojans won the game 48-7. 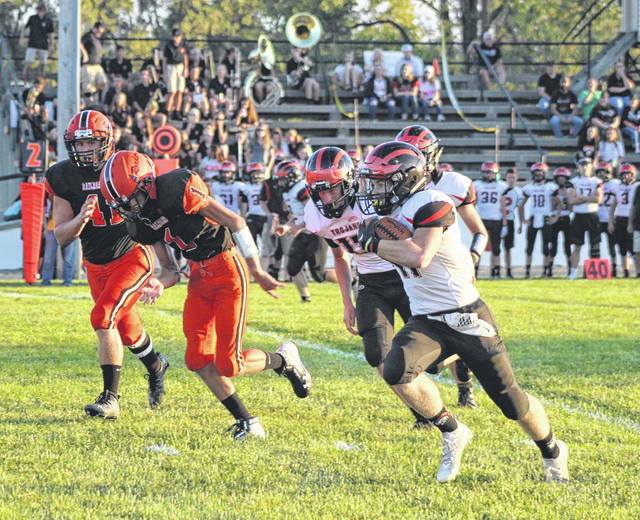 Bradford’s Larkin Painter (80) turns up field for a short gain against Arcanum on Friday night. The Trojans defeated the Railroaders 48-7. Bradford’s Larkin Painter (80) breaks free from a tackle and gets back to the line of scrimmage on this play on Friday night against Arcanum. The Trojans defeated the Railroaders 48-7. 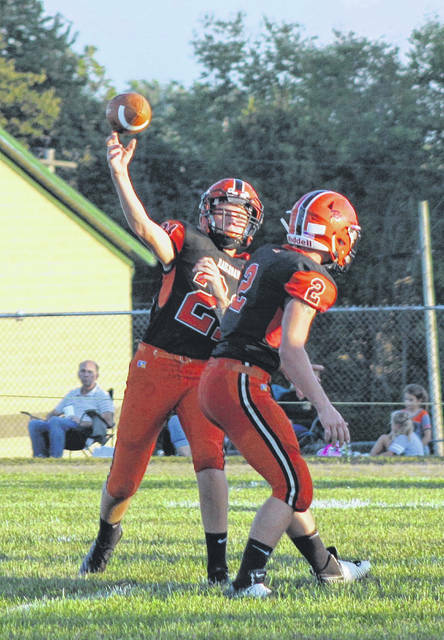 Bradford’s Taven Leach (21) lets go of a pass against Arcanum on Friday night. The Trojans defeated the Railroaders 48-7. 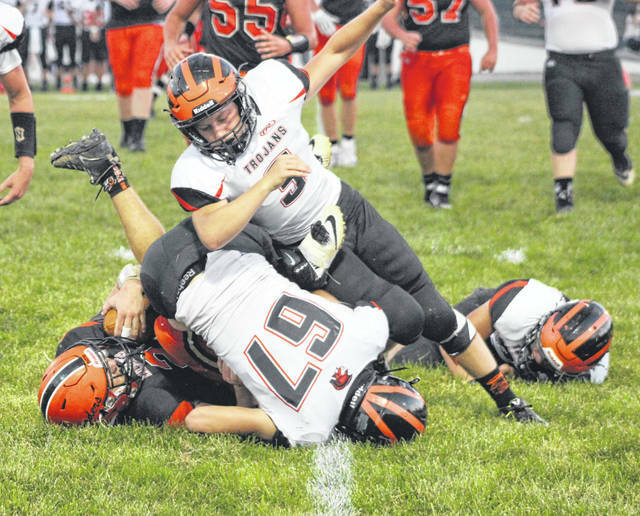 BRADFORD – The first three weeks of the season have been disappointing for Arcanum to say the least, and following Friday night’s 48-7 drubbing of host Bradford for the Trojans’ first win, it would have been easy for them to simply celebrate and then hop on the bus back home. But before he even talked to his own players, Arcanum coach Jason Schondelmyer spoke in the Bradford post-game huddle. “I feel for Bradford. I really do,” Schondelmyer said. It’s no secret the Railroaders have a lot of adversity to deal with this season themselves with only 13 players on the roster. Cruse said Schondelmyer’s words were exactly what he and his staff have been preaching all season. “Coach Schondelmyer came into our huddle after the game and told our players he was proud of them,” Cruse said. “He said it takes nerve for them to do what they do and that is the same thing we have been broadcasting to them all season. As far the game goes, Arcanum had the ball first in the opening period and wasted no time in putting points on the board. The kick-off return went to the Bradford 36-yard line and then on the second play from scrimmage, junior running back Cory Ross took it outside for a 24-yard touchdown. The extra-point try failed and it was 6-0 Trojans with 11:26 left in the first quarter. 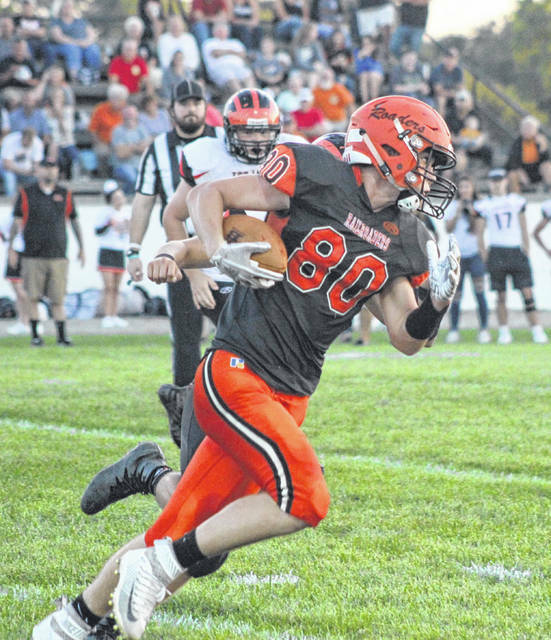 Bradford took its first possession from its own 28 and moved into Arcanum territory mixing the run and pass well together, but on the seventh play of the drive, Arcanum’s Ethin Hoffman intercepted a pass and took it to the Bradford 35-yard line. It was the first of four interceptions on the night by the Trojans. Two plays later, Devin Keckler burst into the open for a 31-yard score. The two-point conversion run was successful and Arcanum had a 14-0 lead at the 6:33 mark of the opening frame. 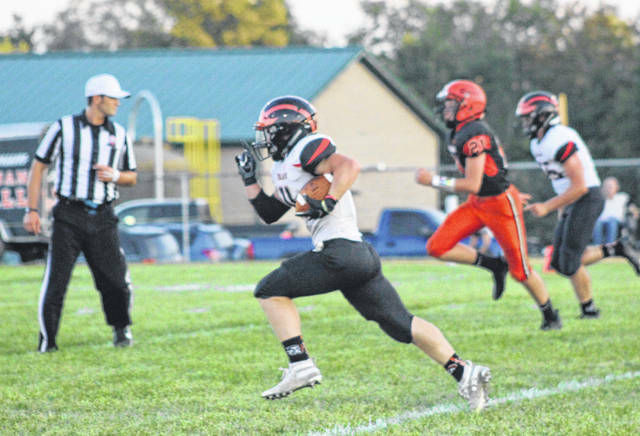 On Arcanum’s next possession from its own 25-yard line, Ross broke free on the second play for a 75-yard touchdown run, his second trip to the end zone in the game and a 21-0 lead. He finished the night with 7 carries for 151 yards and two rushing touchdowns unofficially. The score reached 28-0 with 2:09 left in the first quarter when Keckler intercepted Taven Leach’s pass and returned it approximately 40 yards for a touchdown. 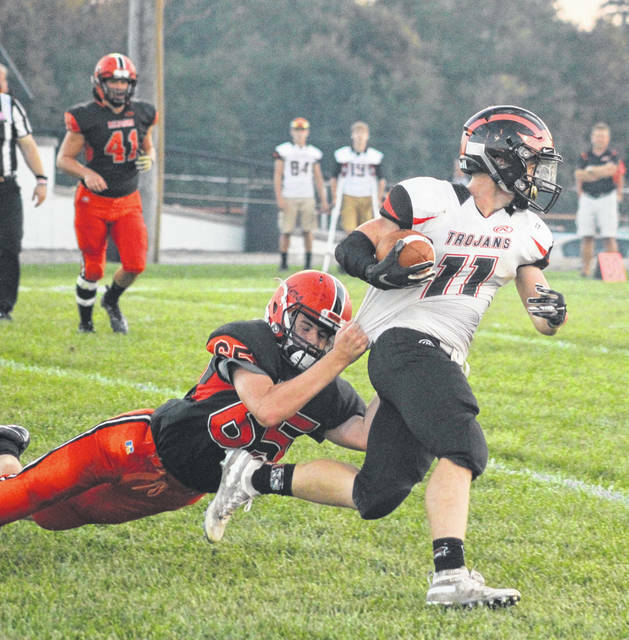 Arcanum’s third interception of the game by Ian Baker came on the first play of the second quarter setting the Trojans up on their own 15-yard line. 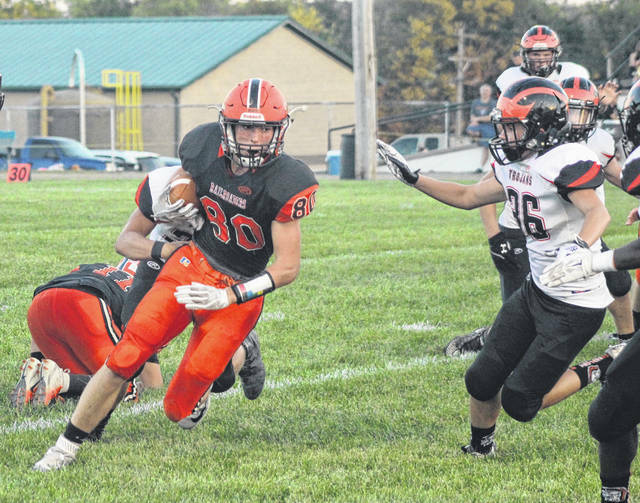 An eight-play drive ensued from there with several big gains on runs of 13, 18 and 31 yards that culminated in a 10-yard touchdown pass from Nick Fry to Keckler and a 35-0 lead for Arcanum. Keckler finished the game with three touchdowns – 1 rushing, 1 receiving and 1 interception return. He had 44 yards rushing on 4 carries and caught 2 passes for 14 yards. The Trojans made it 41-0 going in at halftime when Cameron Burke recovered a fumble and returned it approximately 60 yards for a touchdown. 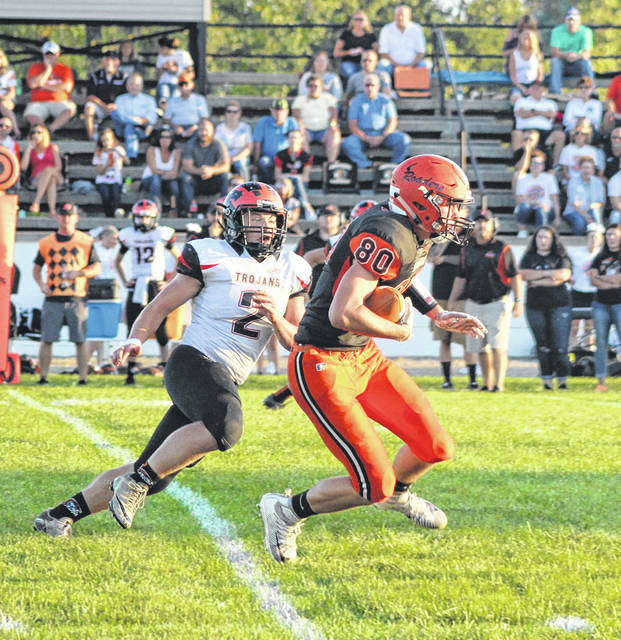 The third quarter opened with a running clock and after Bradford possessed the ball first, Arcanum took possession on their own 40 and methodically moved the ball down field on eight plays capped by a 4-yard scoring run by Fry making it 48-0. Just like Coach Cruse said, however, his Railroaders didn’t quit. Despite being down 48-0, Bradford kept fighting and after forcing a pair of Arcanum fumbles in the fourth quarter, Leach connected with Jay Roberts on an 18-yard touchdown strike to put Bradford on the scoreboard with 1:26 left in the game. “I am very, very impressed with my kids because they don’t quit,” Cruse said. “It may not look like it with the score, but in some ways we are getting better. That particular (touchdown) play was there all night, but we just couldn’t get it timed up right. My staff and the kids are doing the best they can do. We just come out every day and practice and play like everybody else does. We show up and that’s about all we can ask of them. Leach completed 8-of-20 passes for 89 yards and the touchdown to Roberts to lead the Railroaders. Larkin Painter was the top rusher with 21 yards on 7 carries. 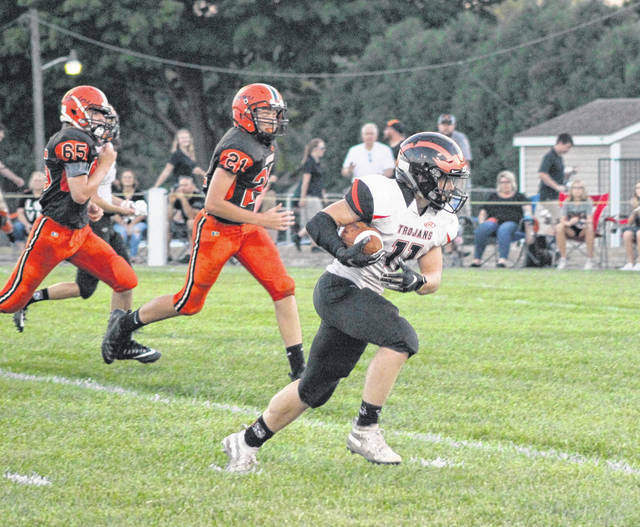 For Arcanum, after Ross’ 151-yard performance was Keckler with 44 yards on the ground. Fry was 3-of-4 for 16 yards passing with a TD. Defensively, Arcanum had four interceptions – one each by Hoffman, Keckler, Baker and Luke Wilson, as well as the fumble recovery by Burke. Next week, Arcanum will host Covington while Bradford travels to Tri-County North. This entry was tagged Arcanum Trojans, Bradford Railroaders, CCC, high school football, Jason Schondelmyer, John Cruse. Bookmark the permalink.